Hello! So glad you stopped by. We invite you to make this Rhode Island PBS Kids Club blog a place for conversation. Jump in and let us hear from you! Curious George Goes "Back to the Jungle"
Launch into the adventure of a lifetime with everyone’s favorite monkey in an all-new movie, Curious George 3: Back to the Jungle! In this adventure-filled feature-length movie, Curious George takes a trip to space but crash-lands in the jungles of Africa, leading to an unforgettable journey with new animal friends. Curious George 3: Back to the Jungle premieres Monday, August 17 at 8 a.m. and plays again at 4:30 p.m., and Saturday morning, August 22 at 7 a.m. On Learn, see it at 3 p.m. on the 17th and 10 a.m. on Sunday morning, August 23. An encore presentation of Curious George 2: Follow That Monkey will air at 9:30 a.m. on Monday, August 17, immediately after the new movie. Fun! Imagination! And such talent! It's the Writers Contest for children in Kindergarten - 3rd Grade. There's nothing quite like reading a great story to travel to places up the street, around the globe, and even across the galaxy -- without ever leaving your chair. Reading ignites the imagination and sparks creative thinking. The PBS Kids Writers Contest is one way to capture those creative ideas that come from reading and imagining, shape the ideas into stories, and then share the stories with others. With the news today from PBS Kids announcing the national winners of the 2015 Writers Contest, we thought it would be the perfect time to share the videos of stories by our local winners. We invited our first place award recipients in each grade to come to the Rhode Island PBS studios to read the winning story. You can read and share all of the first, second, third place winners here. Congratulations and thank you to all of our writers! Look for an announcement about next year's local contest, coming early in 2016. The contest will run from January through March. Worrrrrd Up! 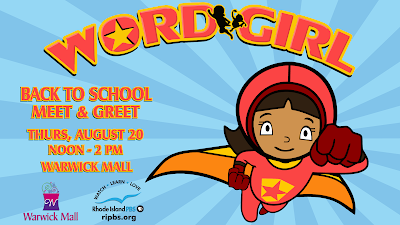 It's Word Girl at the Warwick Mall! The Rhode Island PBS Kids Club in partnership with the Warwick Mall invite you and your children to enjoy an end-of-summer picture takin', fist-bumpin', friend-huggin', and high-fivin' Back-to-School Meet and Greet with WORD GIRL at the Warwick Mall. Join the Rhode Island PBS Kids Club on August 20 from noon to 2. The event is free - and for this one, registration is not needed. Just bring the kids. Oh - and don't forget to bring your camera! Looking for a few ways to fill the last few weeks before school? 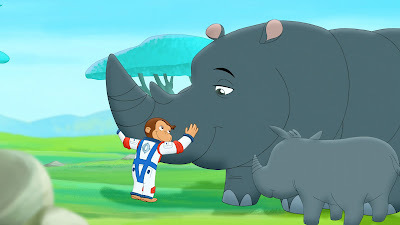 Get your kids – school age and younger – excited about eating healthier with free printable activities, family-friendly recipes, and episode clips from Daniel Tiger’s Neighborhood. Try Mom Tiger’s Banana Bread. Make-Your-Own Pizza is sure to be a hit. Printable recipes can be found here. Copyright 2011-2013 Rhode Island PBS Kids Club and WSBE Rhode Island PBS. All rights reserved.